When we checked into our fabulous cottage (upon which more will be written later), we found the requisite stack of flyers for activities and attractions around the island. Among these was a flyer for tours of the Steelgrass Chocolate Farm. I like chocolate, so I read the flyer. 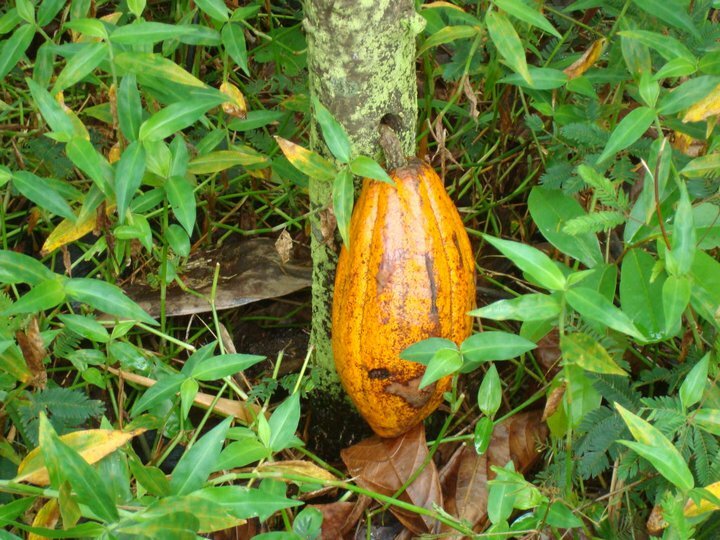 Did you know that Hawaii is the only state where chocolate grows? That's not because no one's bothered to plant a chocolate tree in California or Louisiana. It's because Hawaii's the only state in the right latitudinal zone for the trees to grow. Notice I keep saying "state". Chocolate grows in Puerto Rico too, but as they're not a state (at least not yet anyway), they don't count. I was sold. I mean, when else am I going to be able to tour a chocolate farm? We called, made the reservation, and received an email addressed to "Ms. Davidson" with detailed and seemingly unbelievably complicated instructions on how to get there. Somehow we deciphered these, and early one Monday morning we drove to Kapaa and found the farm at the end of a winding residential road. The place is clearly run by a family of very well-meaning, environmentally conscious, hippies. A fact that was confirmed just now when I googled the farm and discovered they also have the only professional music studio on the island. I now know you can even stay there if you want, at what appear to be very reasonable rates. The family in question, the Lydgates, have been in Hawaii since the 1860's and have a large park named after their great-grandfather a short drive away. And yes, I'm sure bamboo is the only grass they grow on the farm. A few things you should know before taking the tour, if you happen to be in Kauai and find yourself taking the tour. Secondly: The tour groups are way too f-ing big. I mean, I showed up half worried we'd be the only two there. Instead, we were surrounded by a million tourists. Many of them terribly annoying in that tourist sort of way. Thirdly: There were a lot of children on the tour. I'm sure the people of Steelgrass would like to think that's a good idea, and I'm sure the parents thought it was a great idea when they planned it, but really it isn't. For one thing, the tour is mostly talking and learning about chocolate production. Then when you get to the tasting, it's all dark chocolate, and you know how kids love dark chocolate. All that said, we still had a good time. The tour involves, as mentioned, learning about chocolate production, but it also involves tasting a lot of the tropical fruit they grow on the farm. We got to chew on sugar cane (not grown on the farm). We saw papyrus and vanilla and pineapple, and sat down under tent to taste chocolate from around the world as tropical storms blew through. Yum and exotic. As the very funny tour guide said "You're on a tour of a chocolate farm in Kauai, clearly you've done something right with your life to this point." It was a beautiful way to spend a morning, but with a smaller tour group, it could have been just as beautiful, less annoying, and about half as long.